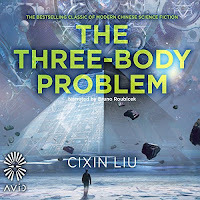 I hardly ever read science fiction novels (and had never read any book by a Chinese author before!) and chose this one only because my friend recommended it. "The Three-Body Problem" ponders big ideas, such as limitations of science, presence of other civilizations in the universe, technological advancement and its impact on human nature. Many of these ideas are supported by actual scientific theories, which makes the events presented a bit more credible. The story is presented through different timelines and puts the protagonists in extreme situations where choices of individual can affect the fate of entire mankind. I did enjoy some of the ideas presented here (such as how the alien race seeks to undermine scientific achievements among humans and plants a seed of doubt as a method to prepare for their invasion), but the high tech theories mixed with scientific data proved at times a bit too much to fully enjoy it.